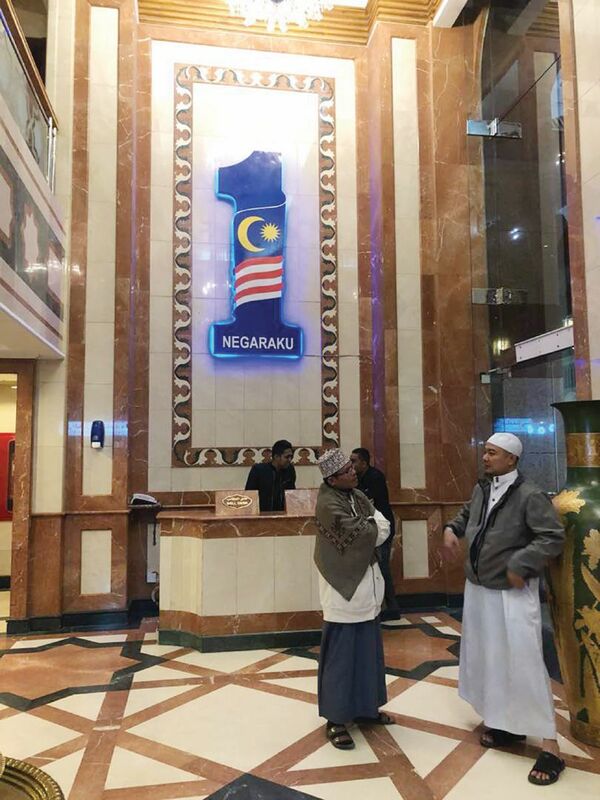 The 1Malaysia Negaraku logo at the ground floor of the Al Haram Hotel in Madinah where the writer is staying. I AM still in Madinah as I write this, having performed the umrah in Makkah earlier. In these two holy cities, Malaysia and Malaysians are well known among the locals. “Malayzie?” I am asked as I walk passed the shops on my way to the mosque here. Responding with a smile or a nod, the traders will respond with either “Malaysia Boleh” or Malaysia bagus” and a thumbs up. And the “1Malaysia Negaraku” logo still stands proud on the wall behind the concierge counter at the ground floor of the Al Haram Hotel where I am staying now. “(Prime Minister Datuk Seri) Najib was here,” said Farhan Mubaroek Lubis, our mutawwif (guide). The huge logo did take my entourage of seven by surprise when we arrived here a few days ago from Makkah. Najib was in Makkah and Madinah early this month as part of a working visit to Saudi Arabia. And the logo is still up there on the wall; a welcoming sight to all Malaysians staying there. The traders here would holler Najib’s name when they know that we are Malaysians. Also that of celebrities Datuk Siti Nurhaliza and Neelofa. I have travelled far and wide either on assignment or on my own. I have seen things that relate to Malaysia — the flagpost bearing the Malaysian flag at the United Nations in New York, the Penang restaurant in Boston, the Petronas signage in South Africa, Tourism Malaysia campaign posters on the London buses, Proton cars on the streets in Europe, and Malaysia Airlines planes at airports around the world. As with the logo, they give me a warm and fuzzy feeling when I am thousand of miles away from home. Politics takes a back seat here. We see one or two politicians performing the umrah but we do not talk about them. Our time is mostly spent in the mosques. Talks during meal times — the only time when we see each other as we go about doing our own thing most of the time — centred on how many umrah we had done, whether we circumambulated the Kaabah on foot or using the scooter, where we had gone for the ziarah (tour of the religious sites), the food at the hotels we are staying at and the bargains at the many shops outside the mosques. Even the locals are not engaging us in any political discussions. An official of the Masjidil Haram was more concerned over whether we had a good stay in Mecca and asked us to seek him out for any help we may need. He had met several politicians from both sides of the divide and could engage us on any political topics but he did not. So, I find it difficult to believe that any Malaysian would say that they are from another country when they are overseas. Malaysia is not perfect. This is a fact that none of us can deny. It has its flaws at all levels as other countries do too but it is not something that we cannot make right. I would not, and I know many Malaysians who would not run the country to the ground. Despite its imperfections, it is still very much tanahairku, which is among others the second best country to start a business, 4th best to invest in and the country whose passport is the fourth most powerful in the world according to the Global Passport Power Rank 2017. It is also 34th among 80 countries in the United States News and World Report LP’s Best Countries listing, a rankings, news and analysis project created by the company to capture how countries are perceived on a global scale. The rankings evaluate 80 countries across 24 rankings drawn from a survey of more than 21,000 global citizens, measuring 75 dimensions that have the potential to drive trade, travel and investment and directly affect national economies. Incidentally, Brunei is not in the report. For better or for worse, it is a place where some 30 million-odd people call home. Indeed, loyalty is to the country first.